To see this part on the iGEM Parts catalogue please click here. Sequences for this part are also available in SnapGene (.dna file), FASTA (.fa file), GenBank Standard (.gb file) and Plain Text (.txt file) file format. 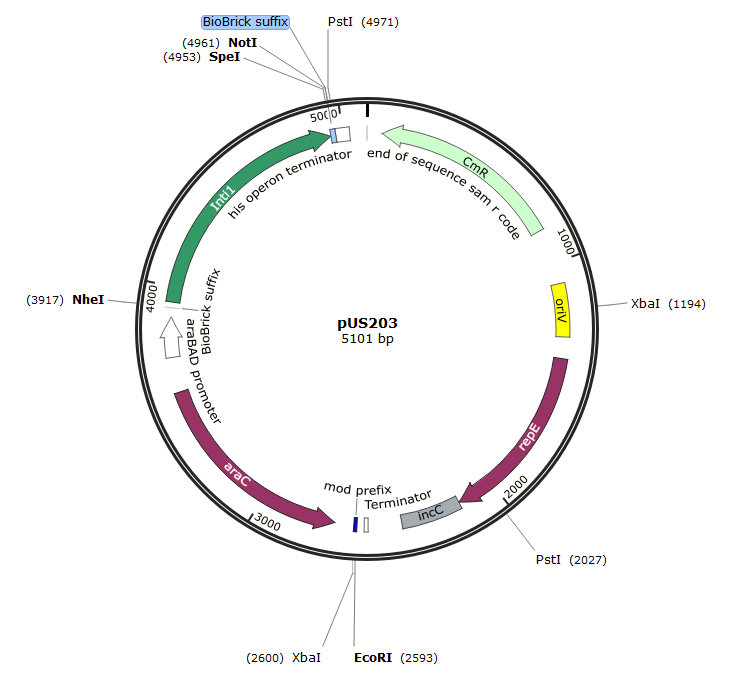 Our aim was to create a controllable Integrase producing plasmid as a submission part. From the submission plasmid the controllable Integrase Part could then be ligated into a convenient low-copy plasmid to help reduce the potential toxicity of Integrase to the cell. The 2010 Paris Bettencourt team had developed a controllable Integrase part for use a population counter in their project. We contacted them to see if we could source the part from them but it was unfortunately not possible. We set about creating the BioBrick using the araC-pBAD from the well characterized part K731201 and ordering the IntI1 as a gBlock. The araC-pBAD system in pSB1C3 had previously been prepared by Honours student Sam Ross (called the SamR construct). Our next steps were the design of the gBlock and integration of the IntI1 gBlock into the SamR construct. Include Gibson ends that overlapped with the backbone for simple Gibson Assembly later with the SamR construct.